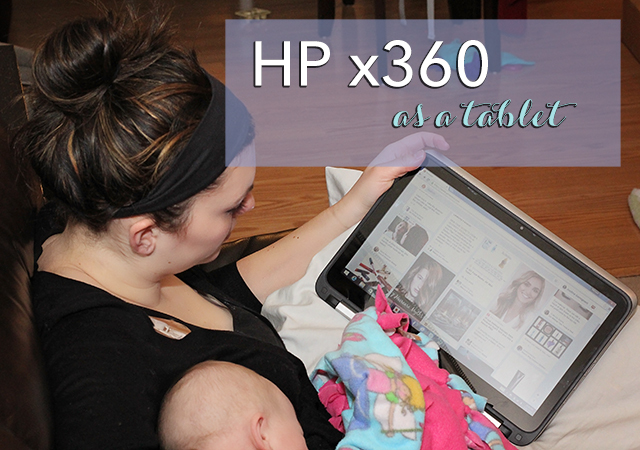 My family has been using and LOVING the HP x360 lately. We have lots of technology in our house, and in fact I counted that we have 10 devices in our house that can connect to the internet! It’s kind of crazy but the HP x360 does a really good job of suiting our needs and helping us meet some of our goals as a family. 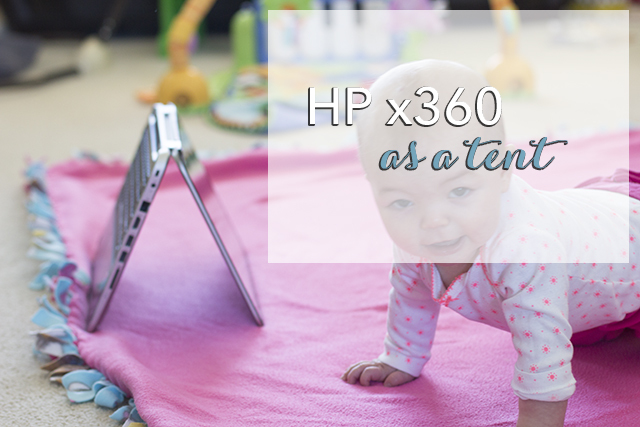 The HP x360 can be used four ways- as a laptop, tablet, tent, or a stand. My two year old is going through the terrible twos right now and if she doesn’t get a nap, she gets CRAZY. We have been using the x360 as a means of playing the internet radio in her bedroom during nap time. I have found playing calming music really helps her fall asleep, and keeping it in stand mode during that time ensures that she won’t get out of bed and start trying to press down all the keys. Out of sight, out of mind, right? One way I’ve been using this is as a tablet. 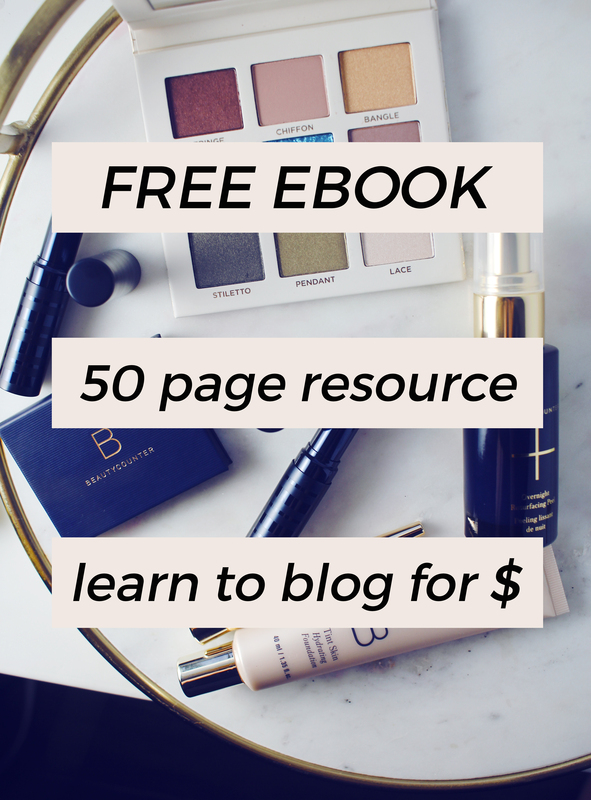 I have been trying to create great content on my blog this year, and do a good job of promoting it as well. 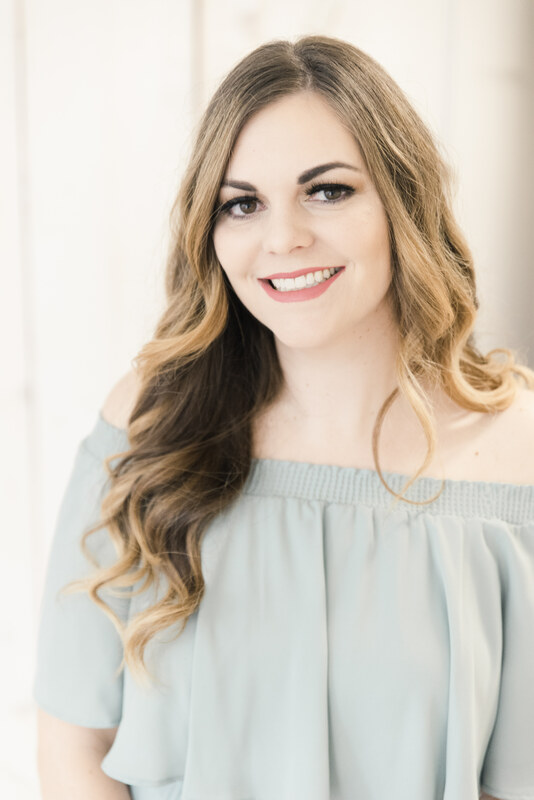 It’s super easy for me to lounge on the couch with this folded over while I cruise Pinterest, especially when I have babies crawling all over me demanding my attention! As many of you know, I stay home with my girls, but my husband works full time. He is also going back to school right now for his Bachelor’s. He’s got lots of homework, so the laptop set up ends up being perfect for him to work on school work. And now that it’s been over 5 months since I had my littlest (seriously, where does the time go?) I need to start focusing on losing the remainder of my baby weight. I went in today for a biometrics screening, required for our health insurance, and found out I’m actually really healthy! It was great news to me because duh, who doesn’t want to be healthy, but I’ve been trying really hard to eat healthy and exercise so it’s nice to see my cholesterol and blood pressure well within the healthy range. The only thing I need to work on is losing a couple inches in my waist, so I’ve been doing home workouts once the girls are down. 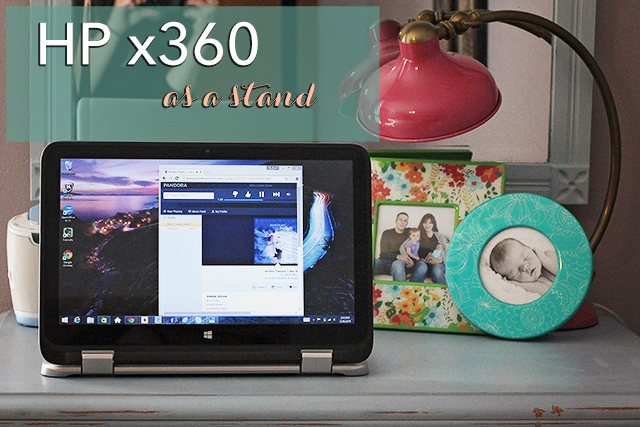 Keeping the x360 in tent mode is perfect for following along with a workout! Although, by the sights of my floor set up, you can see kids get in the way of home workouts! Speaking of getting a good workout, this February and March, HP and Collectively are partnering with Meghan Trainor’s “That Bass Tour.” From Vancouver to Nashville, a camera crew and fans will be watching the whole way! There will be “All About That Tour,” a behind-the-scenes look at elements of the tour like hair and makeup and choreography. Having been in show choir in high school I’m actually really interested in checking this out! There will also be a “Fan Generated Documentary” that Viners, YouTubers, and Instagrammers will be capturing during the tour, and it will be stitched together for a tour documentary. Follow Meghan Trainor by watching Behind the Scenes episodes or following @HP for updates! 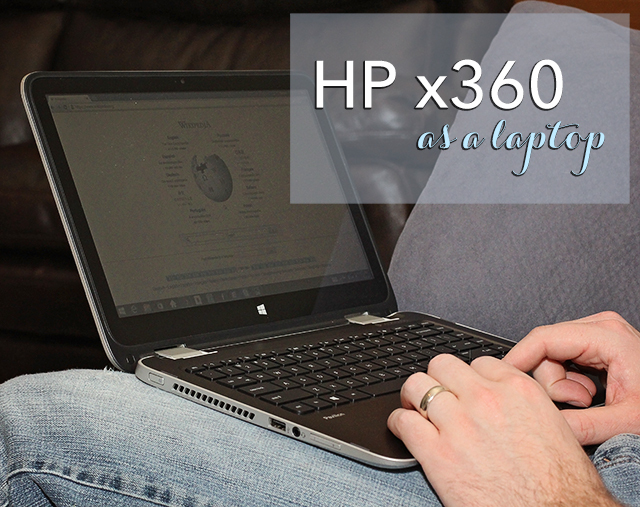 Also, if you’re curious about a little user review of the HP x360, my husband has officially claimed it as his own. He says its processing speed is reasonable and he likes how it transitions between the Windows 8 touchscreen desktop and the classic Windows desktop. The audio is pretty exceptional considering the small size of the actual speakers and it weighs about the same as a normal laptop, so heavier than a tablet. The battery life is also pretty standard. All in all, for the inexpensive price, it makes a great family device. Let me know if you decide to check it out! LOVE this! I really want to check this out because I want something I can use in different ways like you did!